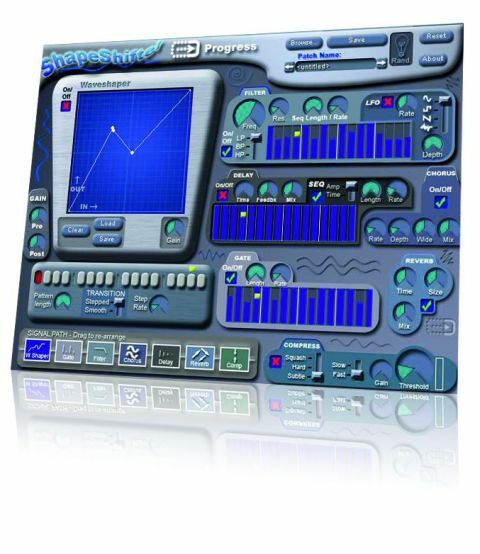 An intuitive, fun and easy-to-use interface means that Shapeshifter will appeal to those who like to tweak creatively. Shapeshifter is one of a new breed of modular effects plug-ins. It combines a variety of envelope, filter, gate, sequencing, compression, chorus, reverb and delay modules, all of which can be turned on or off and rearranged in the signal path simply by dragging and dropping them. The sound quality is good, but the real stand-out feature of Shapeshifter is its interface. Although it´s relatively basic, it´s also very intuitive, and different enough to push you in new directions. There´s also a no-nonsense approach to the list of parameters that makes it fun and gratifying to use. If you want a stunning reverb sound or a classic Lexicon delay, you´ll find Shapeshifter to be a little limited, but at the end of the day it´s not really designed to provide such things. One drawback is the lack of a killer preset selection, and we should also say that Shapeshifter sounds decidedly digital. However, these aren´t necessarily bad things unless you simply must have analogue-style sound or can´t be bothered to program. If these aren´t issues for you, Shapeshifter is well worth a look.